If you own your own skip lorry, either as a self employed contractor or through running your own business, we can help you find really competitive skip truck insurance. The panel of specialist insurers we are partnered with are ready to search out great deals for you, whether your vehicle is designed for mini, midi or large skips, skip loaders or indeed you operate roll on/roll off skips. For those needing to insure a single skip lorry or if you run a fleet of up to 6 skip trucks fill out the form below and we will arrange for our insurers to contact you promptly to discuss your exact requirements and provide a competitive quotation. 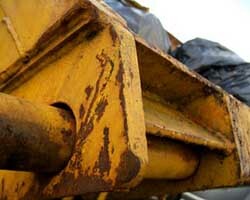 If, however, you manage a larger fleet of skip trucks visit our Motor Fleet Insurance page for fleet skip lorry insurance. Firstly make sure your insurer knows how your business runs. If it's only you or your employees who will drive the skip truck, tell your insurer - if, on the other hand, you have self employed contractors who use vehicles you provide, you need to make sure they are insured. If you can name specific drivers who will use your skip lorries this will save you money, although it will be a less flexible policy if you need to take on additional staff at a busy time. Also, if you can specify a minimum age, say 25 or 30, for your drivers this can also save money. If your fleet is branded with your logo or has a tracker fitted, these are factors which can reduce your premiums. It's a great idea to ask every insurer you talk to the direct question of what can you do to save money on your skip truck insurance. This panel of specialist insurers can help with new businesses or established skip operators but, if you have been running your business a while, do ensure that if you have a good claims experience that this is taken into consideration by your insurer. Ensure you also have adequate liability insurance covering damage to property should there be a mishap whilst loading or unloading a skip. Again our insurers will be happy to provide advice. Brokers and insurers will all have their own factors that they take into consideration when accessing the premium payable for a particular policy so gather as much inside knowledge as possible!